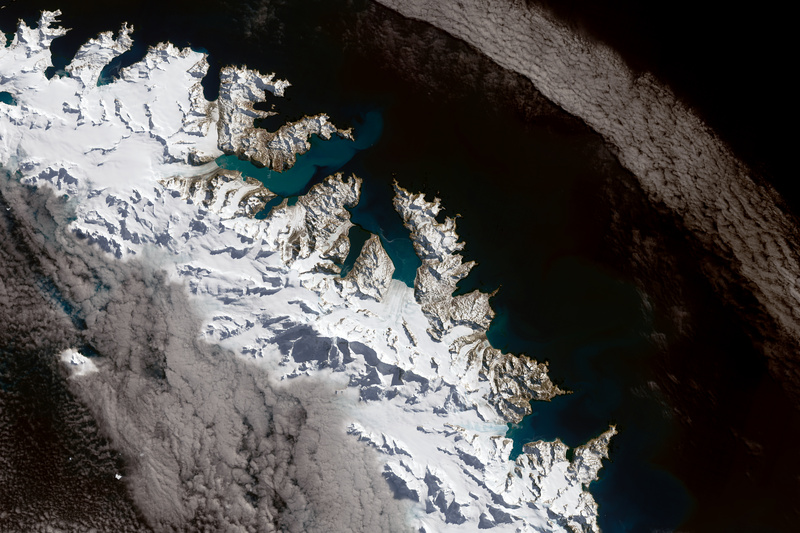 Frequent cloud cover in the southern Atlantic Ocean often obscures satellite images of South Georgia and the South Sandwich Islands. But occasionally the clouds give way. 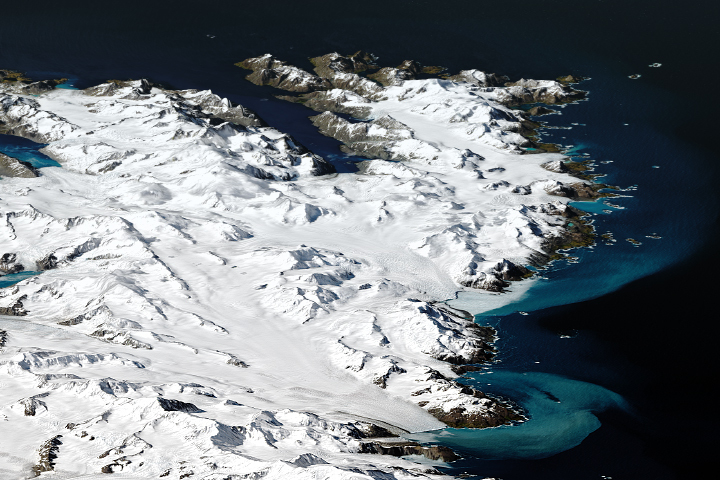 On September 14, 2016, the Operational Land Imager (OLI) on Landsat 8 captured natural-color images of South Georgia Island, where several glaciers are in retreat. 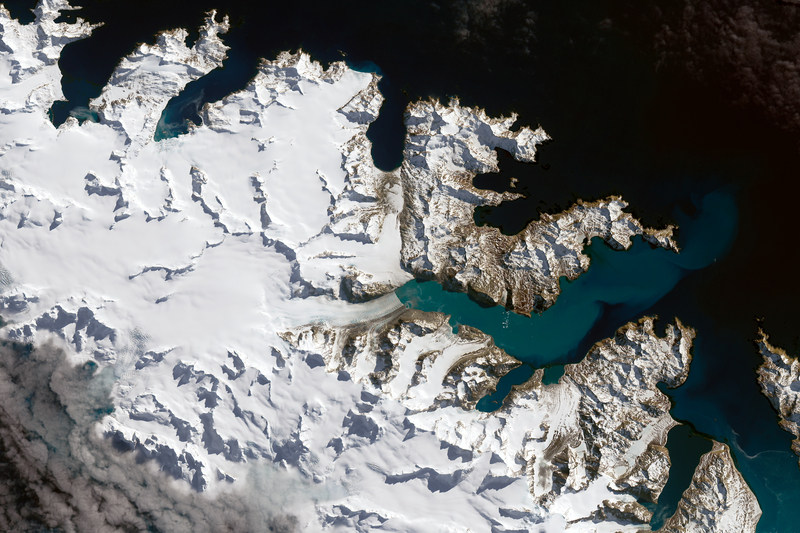 The image below, a closer crop of the Landsat scene, shows Neumayer Glacier. A blue line indicates its terminus, or leading edge, on September 10, 2000. In the past 16 years, Neumayer has retreated more than 4 kilometers (2.5 miles). Like other large glaciers on the island, Neumayer is a tidewater glacier—that is, it flows down into the ocean. “The glacier is on the verge of separation into two main tributaries,” wrote glaciologist Mauri Pelto in his blog. “This will enhance calving from the glacier, and promote additional mass loss and retreat. 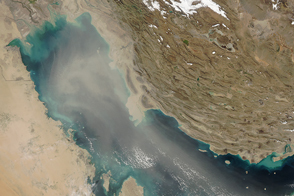 This retreat will impact Konig Glacier to the north, which is connected to the Neumayer Glacier.” Just to the east, sediment stains the waters of Cumberland West Bay. 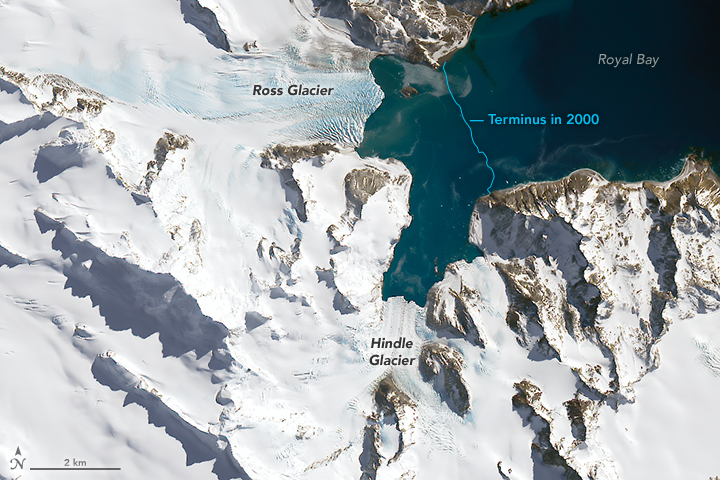 Roughly 30 kilometers (20 miles) to the southeast of Neumayer, on the same side of the island, Hindle Glacier has also retreated markedly since 2000—more than 3 kilometers (2 miles). Like Neumayer, Hindle used to merge with another glacier (Ross). As recently 2002, the two were still connected, according to Pelto. The retreating ice on South Georgia Island could have a significant impact on the island's animals. 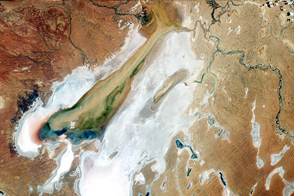 Glaciers act like barriers, preventing the spread of certain animals such as the non-native rats that have become a threat to other species in the area. Rat populations have boomed on the north side of the island as the ice has ebbed, while colonies of seabirds like pipits and small burrowing petrels have declined in number in that area—likely due to predation of eggs and chicks. As glaciers in the center of the island shrink, the rats could spread to the south and decimate bird populations. 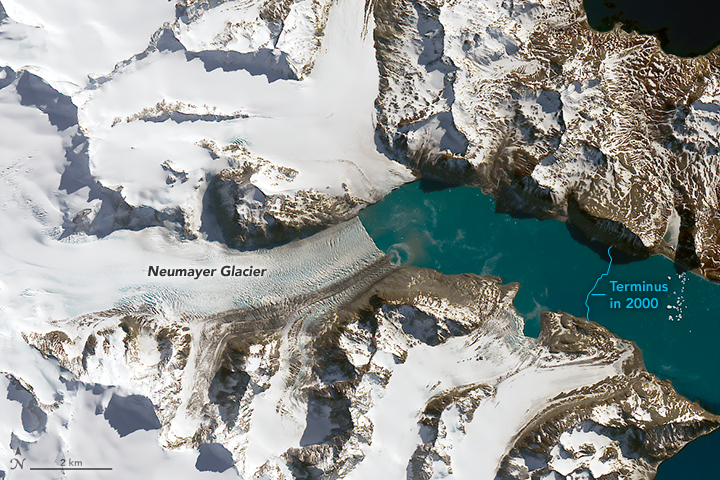 In less than a decade, Neumayer Glacier has retreated at least 2 kilometers. Cook, A. J., et al (2010) Glacier retreat on South Georgia and implications for the spread of rats. Antarctic Science. 22 (3), 255-263. 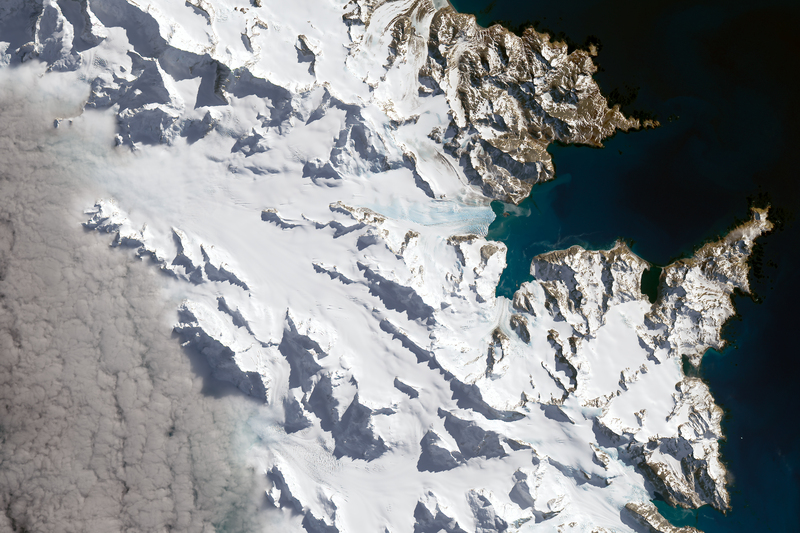 NASA Earth Observatory (2010, August 1) Neumayer Glacier, South Georgia Island. From a Glacier’s Perspective (2010, September 24) Neumayer Glacier, South Georgia Retreat. Accessed February 13, 2017. From a Glacier’s Perspective (2016, April 5) Neumayer Glacier, South Georgia, 5.6 km retreat 1999-2016. Accessed February 13, 2017.